Sherise Kimura, Gleeson Library/Geschke Learning Resource Center, University of San Francisco, kimura@usfca.edu. Reviewed December 8, 2008 – January 9, 2009 and submitted March 13, 2009. Cost: Membership to the Roper Center includes unlimited online access to iPOLL Databank. Membership rates for academic institutions range from $800-$6,500, based on the 2002 Carnegie Classification of Institutions of Higher Education. Authentication: IP authentication is available for academic member institutions. The Center makes data available on its website and through its databases. Two of the Center’s major databases are iPOLL Databank (iPOLL) and the Catalog of Holdings. Accessible from the Center’s website, the Catalog is the Center’s online catalog of archived studies that anyone can search for free. Nearly 10,000 surveys conducted in the U.S. and 7,000 from other countries are indexed in the Catalog and users can search it to find surveys and accompanying datasets or raw data. Only surveys for which the Roper Center holds the datasets are indexed in the Catalog; Center members can download datasets for free, while non-members can order datasets from the Roper Center. 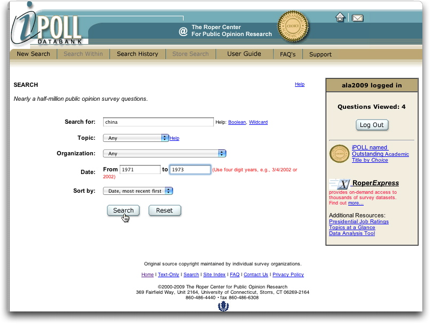 iPOLL is a database that searches the full-text of survey questions and retrieves question-level results (e.g., Figure 3). Data comes from all national surveys in the Catalog, in addition to survey data from many reports and releases for which the Center may not have the datasets. iPOLL contains nearly 500,000 questions and answers from surveys that have U.S. national adult samples or samples of any subpopulation that constitutes a large segment of the U.S. adult population, such as women and African Americans. iPOLL includes questions asked by more than 150 academic, media, and commercial survey organizations including major ones such as the Gallup Organization, Roper Organization, Harris Interactive, ABC News, CBS News, NBC News, Los Angeles Times, The New York Times, USA Today, The Washington Post, and the Associated Press. The database continues to grow, as new surveys and surveys from the Center’s archives are added daily. The number of special sample surveys of women, men, parents, African Americans, gays and lesbians, among others, are increasing as well. Searching iPOLL is very straightforward. From the main search screen (Figure 1), enter keywords or phrases in the “Search For” box. The database allows the use of Boolean logic (“and,” “or,” and “not”), parentheses for nesting, as well as the percent sign (%) as a wildcard or truncation symbol. If you use the asterisk (*), the database will convert it to a %. Although the User Guide advises not to use any punctuation marks when searching, search results were the same whether or not quotation marks were used around two or three word phrases. A link to “Help” in the upper right under the menu bar goes to a page in the User Guide on basic searching, and “Boolean,” and “Wildcard” help links give instructions on using these search techniques in the database. Users have the option of searching by topic from over 100 broad topics covered in iPOLL. Clicking “Help” next to the pull-down topic menu takes you to page where topics are defined. Although the definitions are not detailed, this page is still helpful in giving users a sense of the kinds of topics covered in the database. For example, the topic, “abortion,” has the following definition: Approval of abortion, parental consent for abortion, abortion clinics. Users who don’t want to search by a topic can leave “Any” as the default to search all topics. iPOLL also offers the option to search by the specific organization that conducted a survey. While novice users would probably not use this limiter, more sophisticated users may use it, for example, to retrieve results from a specific poll that came out in several releases. With opinion data from 1935 to the present included in iPOLL, users may want to limit their searches to surveys conducted during a specific time period. 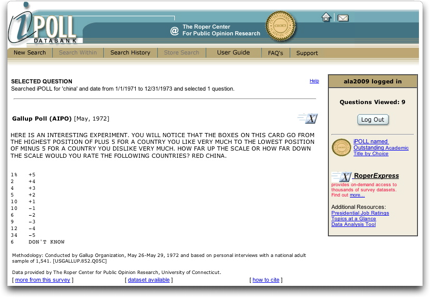 This feature proved extremely helpful for a student at my institution who was looking for changes in American public opinion toward China before and after President Nixon’s historic visit to China in 1972. I searched “China” and selected a date range of 1971 to 1973. By accident, I entered 1975 to 1973 and got no results. A future enhancement to the database might inform the user of this type of error. The last limit option on the main search screen lets you select how you want results displayed: most recent or oldest, first. If any search results are found, your search terms, limiters (if any), and the number of results display at the top of the results screen (Figure 2). Instructions on selecting and viewing selected questions follow beneath, as well as a link to download all results as a text file. You must view selected questions before advancing to the next page, as selections are not saved across results pages. This could be improved to allow users to select questions across multiple pages and from different searches, and view all selections at the end of a session. Results display as top-level questions in the survey. Each question includes the complete question text, followed by the source or polling organization, beginning interview date, and a “question details” link. My search on China from 1971 to 1973 retrieved 183 results. I elected to display the most recent results first but if I wanted to reorder the results, there’s no way to do it from the results screen; I would need to return to the main search screen, change the sort order, and re-run the search. The option to sort results in reverse order from the results screen would be a nice addition. For the student’s search on attitudes toward China, we found a Gallup Poll survey conducted in May 1972 that asked the same question again in another survey administered in April 1973 with a comparable sample. In May 1972, 34% said they disliked China very much and in April 1973 that number had dropped to 15%. The student was extremely pleased to find this comparative historical data. Similarly, users can choose among questions that address the same issue but ask entirely different questions. For example, a search on “drivers license% and illegal immigrants” retrieved six results, the most recent from an NBC/Wall Street Journal Poll conducted in April 2008. The question reads as follows: “(Now let me read you some critical things that have been said of the (2008 presidential election) candidates. For each one, please tell me whether this issue gives you major concerns, moderate concerns, minor concerns, or no real concerns about that candidate. )…It’s hard to tell where Hillary Clinton stands on the issues because she changes her positions on things like NAFTA (North Atlantic Free Trade Agency) and drivers licenses for illegal immigrants to improve her chances of being elected.” While this question and answer sheds light on public opinion toward Hillary Clinton’s views, it may not be relevant to a student looking for American public opinion on the issuing of driver’s licenses to illegal immigrants. The results of a February 2006 Quinnipiac University Poll that asked, “Do you support or oppose allowing illegal immigrants to get drivers’ licenses?” better meets the student’s information need. Clicking “question details” under a question on the results page takes you to a selected question page (Figure 3). More information about the survey can be found on this page, including survey title, text of the question, national response percentages, a brief description of survey methodology, sample size and description, surveying organization, and sponsor (if applicable). The “Help” link at the top goes to a page where terms used on the “question details” page, such as responses, survey organization, research sponsor, and sample size, are defined. Up to three different links appear at the bottom of the selected question page: “datasets available,” “more from this survey” and “how to cite.” “Datasets available” means a detailed description of the study, codebooks or other study documentation, as well as the raw data, are available for free download. The icon represents RoperExpress, iPOLL’s data on-demand downloading tool that links to datasets in the Catalog of Holdings. Users at member institutions have unlimited use of RoperExpress for data download in ASCII or SPSS formats. RoperExpress is available for about 75% of the Center’s studies. “More from this survey” in the bottom left links to a list of questions that appeared in the same release. Because this may not represent all questions asked in a survey, searching by survey organization, using the beginning interview date of your selected question, should find the results of an entire survey. Users should be aware that questions do not necessarily display in the order they were asked. Only by looking at the questionnaire provided through RoperExpress can you see all questions asked in the correct order. Undoubtedly, for this reason, graduate students and faculty, and some undergraduates, will want to access the questionnaires and study documentation. Additionally, both novice and expert searchers would benefit by having more information about survey methodology, design, sampling, purpose of the survey, and even access to the raw data, in order to evaluate data quality. In his excellent review of polling databases, Stephen Woods notes, “These types of databases need to provide some level of evaluative information that allows users to identify deficiencies” (2007: 41). While iPOLL does have brief notes about these elements in the selected question and “more from this survey” pages, more information can be found in the accompanying documentation and datasets, if and when these are available. The Center features access to datasets for about 75% of the studies in iPOLL, which means a user may not be able to thoroughly evaluate a fourth of the studies (although for selected studies, study documentation is available and may give this information). Because survey organizations sometimes make data available in releases, for newer polls, it may just be a matter of waiting for a future release. In these instances, the Center recommends users sign up for their email newsletter and data acquisitions notices or check the “Recent Acquisitions” page on the Roper site. Datasets for some older studies just may not be available from the Center. The Center recommends users acknowledge the Roper Center as a secondary source for any information taken from the database. Click “how to cite” in the selected question to view two suggestions for citing data. The first example is a general acknowledgement that the data was taken from iPOLL; the second, an APA formatted citation for the selected question. Users can narrow their search by choosing to search within results. After executing a search, click “Search Within” at the top. Your current search criteria displays followed by a text box where you can add terms to narrow your search. For my search on China from 1971-1973, I added the term, “Nixon” and got 119 results, 64 less than my original search. Since this database is not text heavy, most users will find this feature sufficient for refining searches. To run a completely new search, users will need to click “New Search” to return to the main search screen. A message on the “Search Within” page recommends users go to the “Search History” page if they do not want to search within their current results. In multiple attempts, the “Search History” link in the message leads to an error message screen that says the application session had a runtime error. Aside from this problem, directing users to “New Search” on this page would be helpful since even if you view your search history, you’re not able to revise your search criteria unless you run a new search. All searches are saved and can be viewed anytime during a session by clicking “Search History” in the top menu bar. To re-run a search, click the link for the appropriate search criteria. Users have the option of storing searches for future use as well. To store a search, after a search is executed, click “Store Search” in the menu bar. When you log in at a later date, click “Saved History” to view your saved searches. At this time the Center does not limit how many or for how long searches will be saved. While storing searches is a nice feature, as mentioned earlier in this review, it is tied to the email address you enter when you log in. The Roper Center site offers a lot of free, potentially useful data. Under “Data Access” in the top menu, free survey data can be found under the categories, “Topics at a Glance,” “Presidential Approval,” and “US Elections.” “Topics at a Glance” addresses issues such as the economy, government institutions, and social issues, among others. On the topic of the 2008 financial crisis, 15 questions and answers out of a total of 156 in iPOLL are available, with questions as recent as November 2008. The list of issues continues to grow as a new topic is added every month. Under ‘Presidential Approval,” approval ratings are given for President Bush, from 2001 through December 2008, as well as comparisons with selected past presidents. 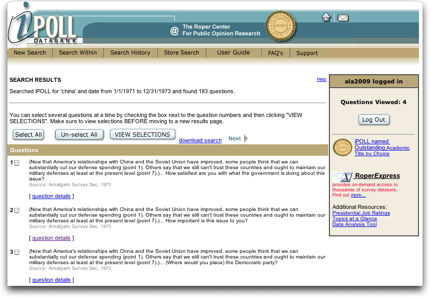 The “US Elections” section contains valuable public opinion data collected during presidential campaigns from 1976-2008. Statistics on the presidential election by popular vote are also given for 1940-2004. In addition to the rich data freely available, the Center’s site features informative tutorials under the “Education” menu. A tutorial called the Fundamentals of Polling (Polling 101), is designed for the novice and goes over the basics of public opinion data collection, sampling, survey errors, and understanding tables in iPOLL. This page gets the most number of hits on the Center’s site after iPOLL and the Catalog of Holdings.3 Terms in the Glossary of Terminology are defined using language users unfamiliar with polling could understand. The section on Analyzing Polls includes two components: Computer Analysis and Interpretive Analysis (Polling 201). Computer Analysis briefly covers the use of statistical software to disaggregate data and run tables. Interpretative Analysis further explains survey results and addresses survey quality, sources of error, contextual settings for analysis, and questionnaire design. Users needing an introduction to polling will find these tutorials extremely useful. The “Teaching Tools” section features sample assignments using resources on the Center’s site. Intended for use by faculty and librarians, the assignments ask students to find public opinion data and analyze trends, among other tasks. The concise User Guide accessible from the top menu gives a brief introduction to the database and covers major features such as searching, viewing results, understanding selected questions, search history, and storing searches. Context-sensitive “help” links in iPOLL link to pages in the User Guide. “Support” in the top menu takes users to a page that reports system status, terms & conditions, a suggestion box, and staff contacts for user and technical support. Staff is available from 8:00am to 5:00pm eastern time. Member institutions receive quarterly reports on the number of registrations by status (e.g., undergraduate, graduate student, faculty, staff, librarian, etc. ), sessions, searches, data views, and documentation views, per quarter. Besides iPOLL, there are a number of comparable public opinion question databases on the market. Woods (2007) gives a brief history of polling databases and critically reviews five products, including iPOLL, Polling the Nations, Gallup Brain, Public Opinion Question Database, and LexisNexis Academic Polls and Surveys (no longer available). He notes that except for the Public Opinion Question Database and iPOLL, the other full-text question databases do not provide access to corresponding codebooks, questionnaires, or raw data sets. The comprehensive Guide to Public Opinion Poll Web Sites by Gary Thompson and Sean Conley (2007) is a compilation of free and subscription sources with a focus on public opinion data, especially those that present data in usable formats. Comparisons are often made between the Roper Center and another social and political science data provider, Interuniversity Consortium for Political and Social Research (ICPSR). In an informative session at the ANSS Sociology Librarians Discussion two months ago at ALA Midwinter, featuring Lois Timms-Ferrera, from the Roper Center, and Jared Lyle, from the ICPSR, it was suggested the two centers offer complementary resources. Both collect and disseminate data files and documentation, however, their scope is somewhat different: the Roper Center maintains the world’s largest public opinion data archive, where ICPSR houses the largest archive of social sciences data, which includes public opinion data (Timms-Ferrara 2009). iPOLL is an information-rich database, excellent for finding question-level polling results. Its intuitive, simple interface makes it easy to search and retrieve data. While undergraduates will find ample statistics on a variety of social, political, and economic issues, graduate students, faculty, and other scholars will most likely use it as a discovery tool for new research and methods of inquiry and utilize RoperExpress to access datasets (Woods 2007: 41). This highly recommended resource for finding public opinion data would have wide appeal to many academic users. Many thanks to Lois Timms-Ferrara, Associate Director of the Roper Center for being so helpful and responsive, and answering my numerous questions. Thompson, Gary and Sean Conley. 2007. “Guide to Public Opinion Poll Web Sites: Polling Data from Around the World.” Chicago, IL: Association of College and Research Libraries. Retrieved January 9, 2009 (http://wikis.ala.org/acrl/index.php/Guide_to_Public_Opinion_Poll_Web_Sites). Timms-Ferrara, Lois. 2009. “ANSS Sociology Librarians Discussion: Social Sciences Data – Access and Impact on Scholarship: Reports and Evaluation from ICPSR (Interuniversity Consortium for Political and Social Research) and Roper Center for Public Opinion Research.” January 24. Denver, CO.
1 Lois Timms-Ferrara, email to reviewer, December 16, 2008. 2 Lois Timms-Ferrara, email to reviewer, December 11, 2008. 3 Lois Timms-Ferrara, email to reviewer, February 17, 2009.